The Garden Flat, 3-room apartment on the ground floor. Beautiful and antique furnishings: large living room with open-hearth fireplace and TV (flat screen), DVD. Exit to the garden, to the veranda. 1 double bedroom with 1 double bed and open-hearth fireplace. 1 room with 3 beds. Large kitchen (4 hot plates, oven, dishwasher, microwave, freezer) with dining table. Shower/WC, sep. WC. Heating. Facilities: washing machine, dryer. Internet (WiFi, free). Reserved parking. Please note: non-smoking house. Maximum 2 pets/ dogs allowed. All laundry facilities for this apartment are located in the Scullery with access to a drying room in the basement. 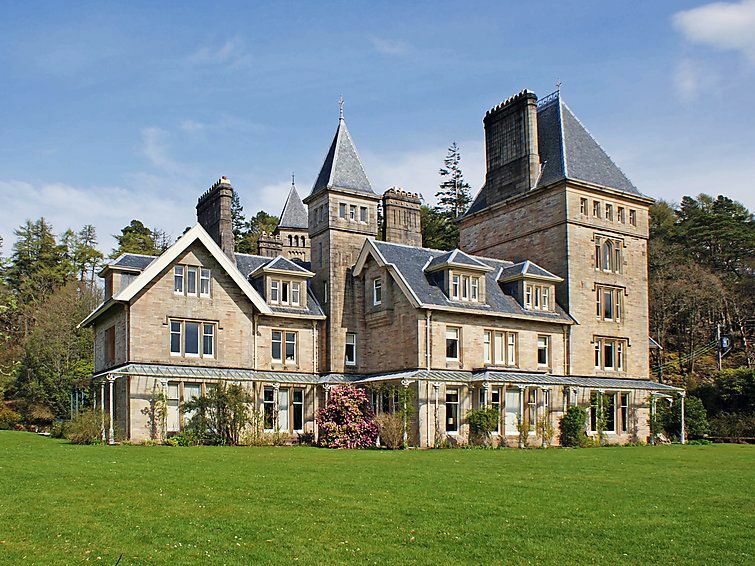 Morvern Peninsula 107 km from Oban: Beautiful, historical manor house Ardtornish, from the 19th century. In a secluded, quiet position, along the wooded area, 400 m from the lake, in the countryside. Parking on the premises. Shop 4 km, supermarket 36 km, restaurant 4 km, bar 4 km, railway station Oban 37 km, ferry Lochaline - Fishnish 5 km, diving center 5 km. Walking paths from the house 500 m. Nearby attractions: Kinlochaline Castle 800 m, Isle of Mull Ferry 5 km, Oban Distilleries (via ferry) 38 km, Ben Nevis, Fort William (via ferry) 60 km. Please note: car recommended. Baby equipment (extra). Fishing [permit required]. The first provision of fire logs is free. The estate tourist centre offers information about the estate, places of interest, good ideas for walks, trips and nature spotting. Access is via a 25km country road with no light in the evening. Oban is only 37km away by ferry or 107km by road. Archery, clay pigeon shooting, kayaking and mountain biking.